Ten Steps to Complex Learning says that complex skills have aspects that you apply differently for each task (the non-recurrent skills) and aspects that you apply in the same way each time you use them (recurrent skills). Heck, even I’ve said that a time or two in this series. I bring it up again because Step 7, design procedural information, marks the move into the third of the four components in van Merriënboer and Kirschner’s model: the procedural information component into which those recurrent skills fit. Just the steps, just in time One definition of a job aid is something that tells you what to do and when to do it, in order to reduce the need to memorize. JIT display of information is like that. For a given set of tasks (meaning, ones with similar difficulty), the procedural information is likely the same, and so you’d provide that information for the first task. 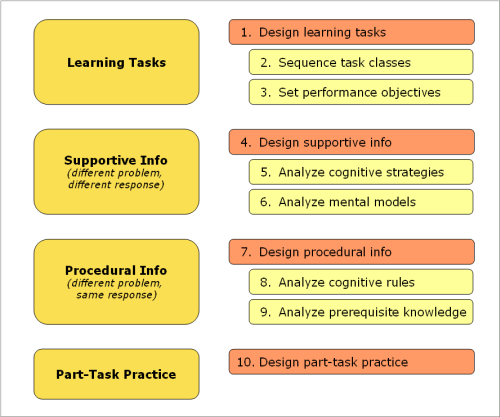 You might gradual reduce or fade the amount of procedural information as the learner continued with additional tasks. The two forms of JIT information correspond to the next two steps in the book: the cognitive rules that you follow (Step 8), and the prerequisite information necessary to apply those rules (Step 9). As I read this chapter, it occurred to me that a lot of organizational training often tries to treat non-recurrent tasks as recurrent, and vice-versa. Take the supposed soft skill of interviewing a job candidate. Some aspects of that skill are recurrent: reviewing the requirements for the job, reading the candidate’s resume, arranging a time and place for the interview, making a checklist of items to verify, using both open and closed questions. So in “how to interview” training, you could provide a checklist to help prepare and conduct an interview. The actual conversation, though, is always going to be non-recurrent: you’re not interviewing the same person over and over. Generic training on “interview skills” can’t just give you a checklist of ten questions and five phases. As noted earlier, for non-recurrent skills, there’s no single right answer. What makes for successful just-in-time display of procedural information? First, a modular structure with small steps. You want the information to have a clear goal that the performer can easily accomplish: “How to change page orientation” is vM&K’s example. The small size and straightforward goal minimize cognitive load. Prerequisite knowledge (e.g., definitions of landscape and portrait) can appear as callouts or hyperlinks. And when it comes to procedural information, nice-to-know isn’t. Next, a focus on entry-level users. A key difference between a procedure and a systematic approach to problem-solving is that procedures are virtually mechanical (vM&K say “algorithmic”): if you follow these steps, you get this result. Third, you want to avoid splitting the learner’s attention. That means minimizing any requirement for the learner to shift back and forth between the actual task and the supporting information. Sometimes you can’t help splitting attention–a person might need to consult a procedure separately from the immediate task. You can’t easily assemble machinery while holding the manual, and you can’t always label the parts with the steps. One approach is to put parts of the task into the reference (through diagrams and illustrations); another one, just on the horizon, is to adapt the environment–e.g., a heads-up display that makes the steps visible through a special pair of glasses. One way to present just-in-time information is through demonstrations, like the “show me” options in help systems that demonstrate how to, say, create a chart in Excel. vM&K strongly urge using relevant, whole tasks for such examples. Let’s say the specific procedure is getting a set of PowerPoint slides to start with a specifed number. One demonstration could have a person who’s created two files and wants to start numbering one set whether the other left off. The larger context is someone who wants two files (Part 1 and Part 2), and the specific example is getting Part 2 to start numbering at, say, 45. That places the renumbering skill in a concrete setting. A later example could have someone wanting to start numbering after the title slide (so the title doesn’t have number, and so the second slide is numbered 1). The same procedure as the other example, but a different demonstration with a different real-life context. A second way to deliver JIT information is through what the Ten Steps call instances, meaning examples. Here you might provide the learner with an example (an instance) of concepts or principles of the skills being learned. For a researcher, you might provide descriptions of different types of databases. Again, you’d want to do so in a context that relates to the task being learned–databases relevant to science if the research is in a scientific setting. Finally, you may need to provide a range of demonstrations or instances. In vM&K’s example of changing page orientation, you might change from portrait to landscape, and vice-versa. You might change the layout of a multi-page document. And you might change the layout of one section in a multipage document, and then change back afterward. That’s enough for one post. Next time: presentation strategies for procedural information (some of which surprised me), corrective feedback, and probably a few remarks about knowledge compilation.